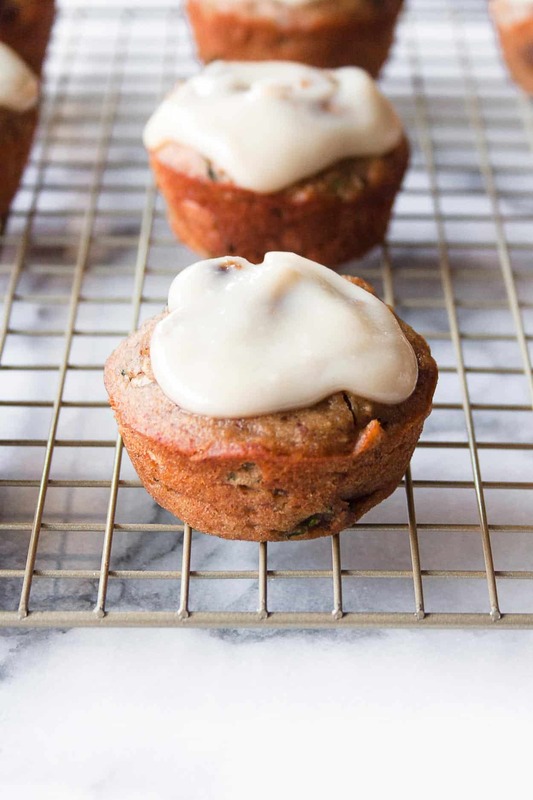 These Paleo Zucchini Banana Muffins using Simple Mills Banana Bread Mix are the perfect healthier muffin to help get us back to balanced! 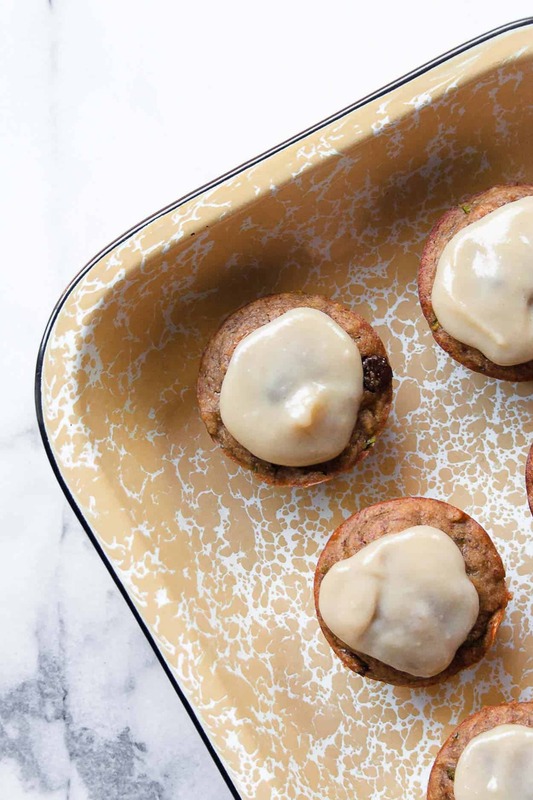 Grain-free, dairy-free and loaded with an extra serving of veggies make these muffins perfect for breakfast or dessert! 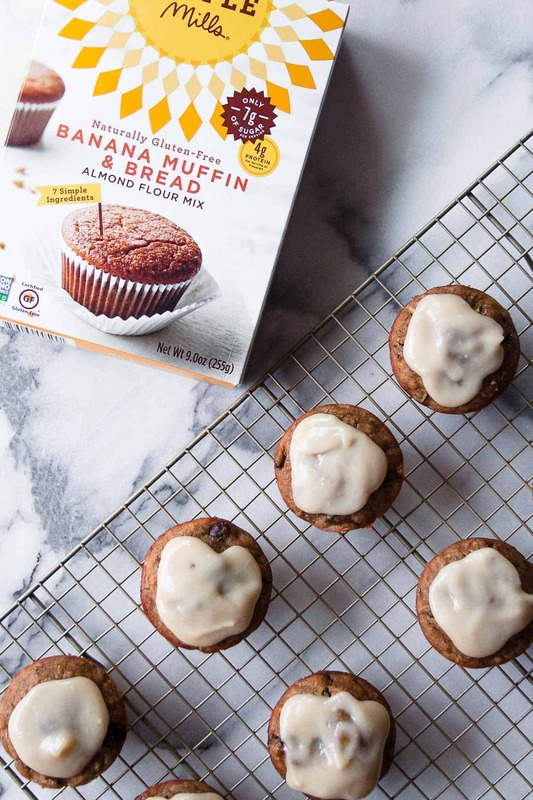 I am thrilled to be partnering with Simple Mills to bring you an amazing recipe using their Banana Muffin Mix. As always, all opinions are my own. Thank you for supporting Hungry by Nature and the brands that make it possible! Alright friends. It’s somehow already August, which means it’s basically September… which means summer is over and FALL IS HERE. I feel like I have been going, going, going non-stop. In my head, summer is always a nice relaxing season where I get to unwind. But in reality, it’s the opposite. Granted, the extra items in my schedule tend to include weekend trips with friends, movies in the park, dining al fresco – fun things that I feel so blessed to be able to participate in. But all that extra tends to throw me a little off balance. 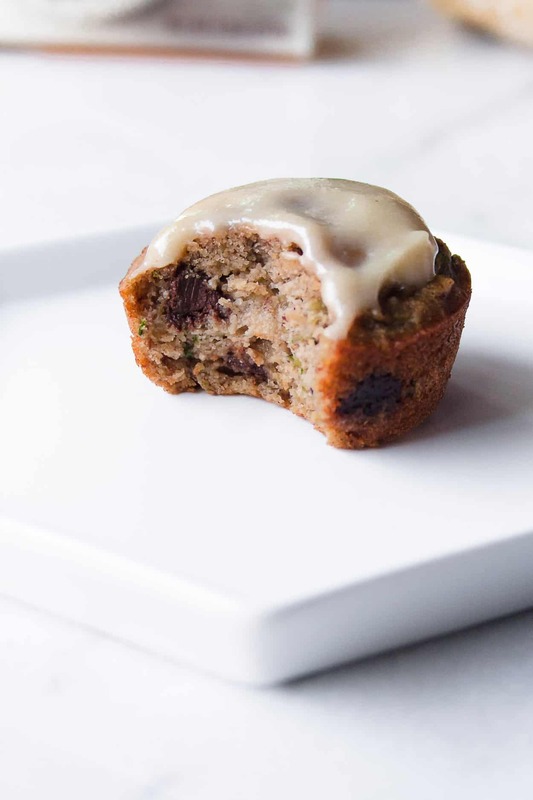 But today, I am getting Back to Balance with these insane Paleo Zucchini Banana Muffins… with chocolate chips and a coconut glaze. We are using the Simple Mills Banana Muffin Mix which keeps these muffins gluten/grain free, dairy free, and made with paleo ingredients. WIN. If you haven’t heard of Simple Mills yet, you really need to check them out. Their product line is outstanding – everything is gluten and grain free, made with simple ingredients that you will actually recognize. My favorites are their almond flour crackers, pizza dough mix, and frosting. But I’m pretty obsessed with everything they make – and I used their baking mixes to make my birthday cake last year! So for the muffins, you just use the banana muffin mix according to the directions on the box to keep things super easy. And then you add in grated zucchini and diary free chocolate chips – I like to add in a vegetable and some chocolate because… balance. Oh, and I almost forgot to mention – you can get Simple Mills baking mixes at Target! HALLELUJAH. I can’t guarantee you won’t leave Target without spend an additional $50 on things you don’t need. But, you do need to head there to pick up these baking mixes! 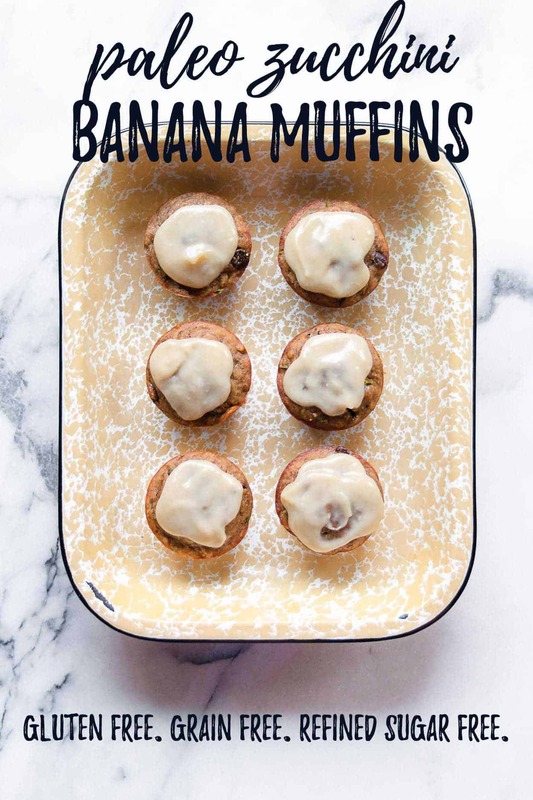 Make these Paleo Zucchini Banana Muffins and post a picture on social media and use the hashtag #imhungrybynature for a chance to be featured! Using a fork, mash the banana. Add eggs, water, and oil. Whisk to combine. Add Simple Mills Banana Muffin Mix and whisk until well blended. Using a paper towel, wring out excess water from grated zucchini. Add zucchini and chocolate chips to mixture and fold in. 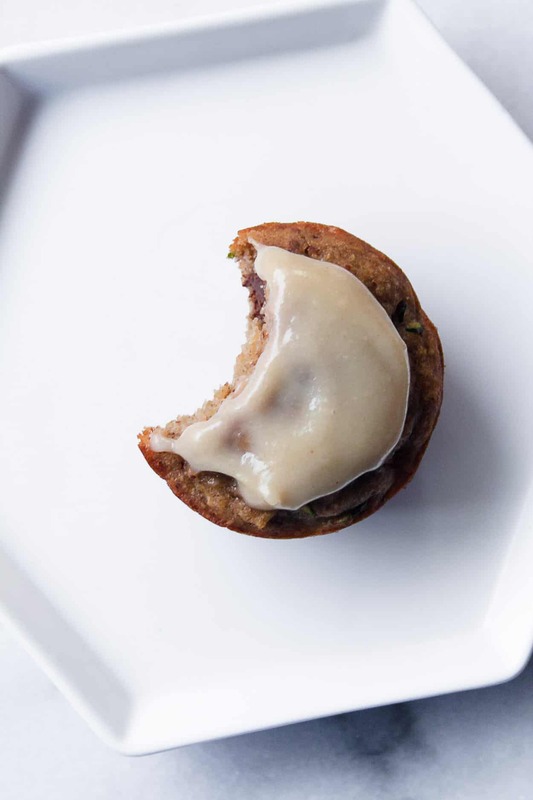 Pour batter into a lightly greased or paper-lined muffin tin, filling each 2/3 full. Cool the muffins in the tin for 5 minutes before transferring them to a wire rack. Once cool, microwave the coconut butter with 1 Tablespoon almond milk. Stir. Add the remaining tablespoon if the mixture is too thick. Stir in maple syrup and spoon over muffins. *You can also use coconut oil or vegetable oil.